Wardley Church Thorne Avenue Sunday Breaking of Bread 3:00 p.m.
Wardley Sunday Bible Hour 5:45 p.m.
Gateshead Sunday Sunday School 3:00 p.m.
Friday WOW Club Weekly 6.30 p.m.
Tuesday WOW Club Weekly 7.00 p.m. The Wardley Christadelphians welcome you! We have been meeting at our premises in Wardley, on the edge of Gateshead Borough since September 2009. Refurbishment will be on-going, but we are always pleased to see visitors - old and new! 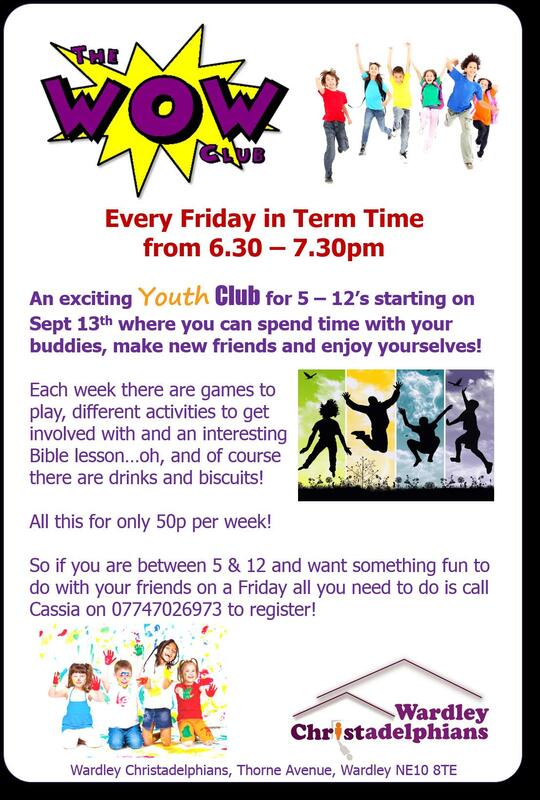 WOW Club (a junior youth club) every Friday at 6.30pm, and also alternate Tuesdays at 7pm - all during term time. 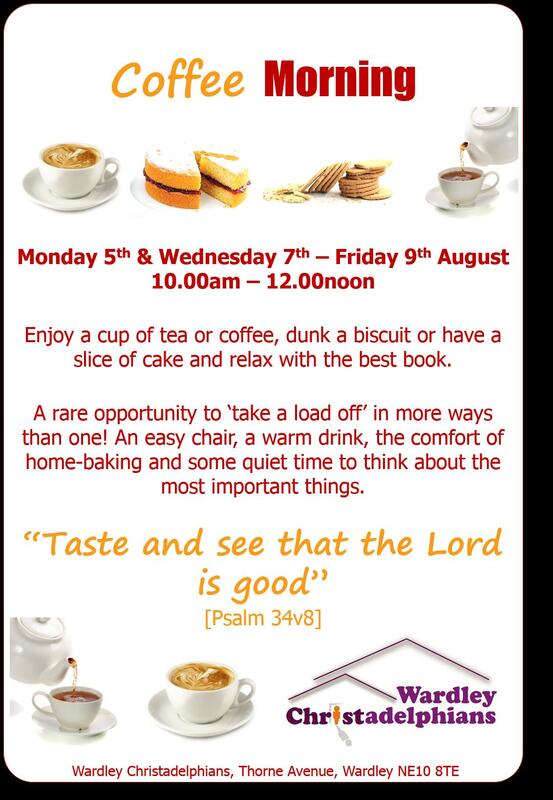 For adults we have Coffee Morning on Thursdays, and Bible Hour every Sunday at 5.45pm. For our own members there is a Breaking of Bread service every Sunday at 3pm, with a Sunday School at the same time. Keep your eyes open for Open Church Sundays when we run a Family activity, so that parents and children can participate. 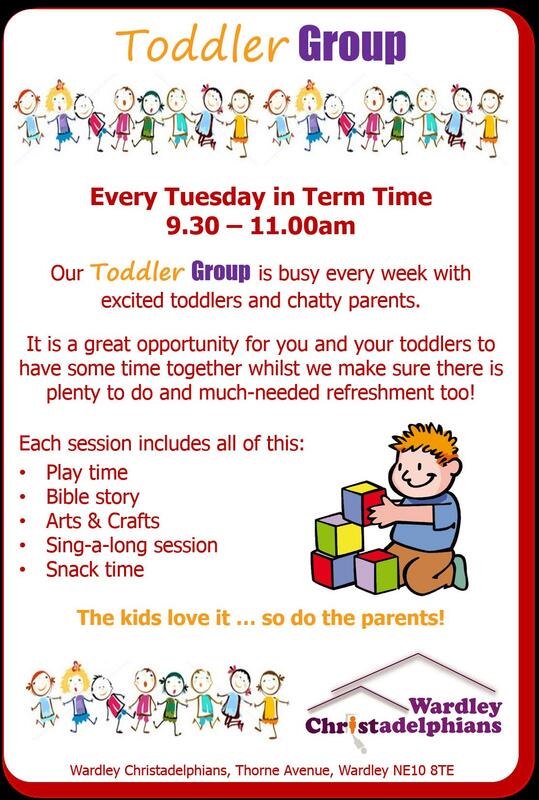 We would love to see you any time - just drop in when we are around.